AURUM eletronic platform run by London Precious Metals Clearing Limited (LPMCL) * Note that forwards are for future settlement and include outright forwards and forward swaps. * Exact weight bars such as kilo bars are also traded among wholesale clients in the London Gold Market. * Although trades settle in unallocated gold in London, trades can be subsequently settled for physical (allocated) gold in London or elsewhere. * Clients of banks include mining companies, central bank and gold refineries. * A London Good Delivery (LGD) gold bar has a minimum weight of 350 fine ounces and a maximum weight of 430 fine ounces, and a minimum fineness of 995 (two nines five). The gold bar is required to display a serial number, the assay stamp of the refiner, a year of manufacture and the fineness to 4 significant places. LGD bars are known as ‘variable weight’ bars, but generally would weigh approximately 400 troy ounces (circa 12.5 kgs). Measured by trading volume, the London Gold Market is the world’s largest wholesale gold market, and in conjunction with the New York / US gold market, is one of the two gold markets that dominates worldwide gold price discovery. Although trading volumes of the London and New York gold markets are both higher than trading volumes in the China gold market, the Shanghai Gold Exchange generates the world’s highest physical gold trading volume. Participants in London’s gold market comprise investment banks (colloquially known as bullion banks), brokers, commodity trading companies, central banks, gold refiners, and gold mining companies, therefore the market is known as a wholesale market. The London Gold Market is an Over-the-Counter (OTC) market where participants trade bi-laterally on a principal-to-principal basis. Some of the London market’s trading characteristics are standardised, but because its’ an OTC market, London gold transactions are flexible on characteristics such as trade size and metal quality/fineness. To trade on the London Gold Market, trading participants need to establish bi-lateral trading arrangements with each other, including bi-lateral credit arrangements. But London OTC gold trades are also governed by standard documentation which provides templates for participants on which they can base their bi-lateral agreements. Standard documentation includes the 1994 International Bullion Master Agreement (IBMA) and the 1997 International Swaps and Derivatives Association (ISDA) Bullion Definitions. The London Bullion Management Association (LBMA) represents the London Bullion Market and is central to any discussion of the London Gold Market. The ‘London Bullion Market’ encompasses the London Gold Market and the London Silver Market, and for all intents and purposes, the London-based members of the LBMA, along with the Bank of England, are the London Gold Market. The LBMA is registered as a private company in England and Wales, company number 02205480. Note that the LBMA is a trade association. It is not an exchange nor does it operate an exchange. The LBMA’s strategy is to promote and develop the London and global bullion markets. This includes the maintenance of the London Good Delivery List for gold and silver, the accreditation of new refiners globally, liaison with regulators and media, publication of documentation and statistics, and implementation of initiatives such as gold and silver price benchmarks and the Responsible Gold initiative (conflict free gold from known sources). The Association has 81 Ordinary Members, 66 Associates, and 9 Affiliates from around the world. These numbers change regularly as new members join, associates move to full membership, or members leave etc. Many of the ‘Ordinary Members’ are investment banks / bullion banks and most of the Associates are precious metal refiners. The LBMA was formed in 1987 at the behest of the Bank of England. Although the Bank of England is not a member of the LBMA, the Bank of England maintains a very close relationship with the LBMA and a representative of the Bank with observer status even sits in on the LBMA Management Committee’s meetings. According to its Memorandum of Association, the LBMA was formed into a Company on 24 November 1987 by N.M. Rothschild & Sons Limited, J.Aron & Company (UK) Limited, Mocatta & Goldsmid Limited, Morgan Guaranty Trust Company of New York, Sharps Pixley Limited, and Rudolf Wolff & Company Limited. Market Makers: All gold market makers in the London Gold Market are obliged to be members of the LBMA, and they occupy a special membership category called ‘market making’ members. All market makers are also London-based entities of international investment banks. Market makers in each product (spot, forwards and options) are obliged to provide bid-offer price quotations, in agreed quantities for that product during London market trading hours. There are 13 market making members of the LBMA, of which 11 are spot market makers. These market making firms are Barclays Bank, Goldman Sachs International, HSBC Bank USA, JP Morgan Chase Bank, UBS, Citibank, Credit Suisse, Morgan Stanley & Co International, Merrill Lynch International, Société Générale, Standard Chartered Bank, The Bank of Nova Scotia – ScotiaMocatta, and Toronto Dominion Bank. Four of these banks, namely, HSBC, UBS, Goldman Sachs, and JP Morgan make markets in spot, forwards and options. Deutsche Bank AG ceased to be a LBMA market maker in 2014. Likewise, Mitsui & Co Precious Metals ceased to be an LBMA market maker in late 2015. Barclays has also announced a withdrawal from the London precious metals market and has downscaled its market making activities, moving from a full market maker of spot, options and forwards, to just spot marketing making. Other Bullion Banks: A large number of other bullion banks are Ordinary members of the LBMA, and they also trade in the London OTC gold market but, unlike the market making members, Ordinary LBMA members are not obliged to make two-way price quotations. Ordinary member banks include Bank of China, ICBC, Westpac, ANZ, RBC, Commerzbank, Standard Bank, Natixis, BNP Paribas, Toronto Dominion Bank, and Bayerische Landesbank. Brokers: Similar to other OTC financial markets in London, such as bond and foreign exchange markets, a number of specialised brokers provide gold brokerage services to the London Gold Market. These brokers, which are also Ordinary members of the LBMA, include iCap, Sucden Financial, Marex Spectron, Prebon Premex (Tullett Prebon), New Edge (owned by SocGen), and Triland (owned by Mitsubishi), and their services include quoting prices in spot and forward markets, pricing of options, provision of direct electronic trading access (loco London unallocated 995 fine gold), and risk management. Note that these brokerages also provide execution (and clearing) services to other major gold exchanges around the world such as the COMEX, as well as access to other gold OTC products. Bank and Broker Customers: A broad array of London Gold Market customers use the trading services of the above market makers, bullion banks and brokers. These customers include industrial users of gold, refiners, miners, central banks, large jewellery companies, investment funds, hedge funds and speculators. Since it’s an OTC market, gold trading statistics for the London Gold Market are not published because the LBMA and its bullion bank members choose not to publish these trading statistics. The only relatively contemporary trading data available comes from a voluntary survey of the London market conducted by the LBMA in 2011. That survey aimed to highlight to the Basel Committee on Banking Supervision that gold is a highly liquid asset. The survey (which was exclusively of LBMA members and only responded to by a subset of members) covered the first quarter of 2011 and collected trading data for spot, forwards and other transactions (e.g. options and commodity related swaps), but it excluded gold deposits/loans. Although not obligatory, 36 out of 56 members who were active in gold trading responded to the survey (including all spot and forward market makers), and the data provided by each responder included trades with non-members of the LBMA, as well as trades with other members of the LBMA. The survey results found that within first quarter 2011, 10.9 billion ozs of gold were traded, worth $15.1 trillion, representing 385,000 trades. Spot gold trades were approximately 90% of trading turnover, with forwards and other transactions each accounting for 5% of turnover. On an average daily basis, this is equal to a trading volume of 173 million ozs, worth $241 billion, and representing 6,100 trades per day. Although the London traded volumes are not published, monthly clearing volumes are published by the LBMA. Clearing volumes are defined as netted trading volumes. Given that 1.18 billion ozs of gold were cleared over Q1 2011, this indicated that the ratio of trading turnover to clearing turnover was a 10:1 ratio. Therefore, London Gold Market trading volumes can be estimated by reverse engineering LBMA clearing volumes using the findings of the 2011 LBMA liquidity. The OTC London Gold Market uses accounting mechanisms of both allocated and unallocated accounts. With an allocated gold account, the account provider acts as custodian to the gold, and the account holder has entitlement to specific identifiable bars of gold. The gold is said to be stored on a set-aside basis and is accounted for by a weight list which includes assay/fineness and refiner brand and serial number details per bar. The account holder retains full title to the gold deposited, therefore there is no credit risk involved in the arrangement. The gold held would also be insured against loss by either the account provider or the account holder. Allocated account balance updates occur when physical bars are moved in or out of an account (and possibly physically transported), or alternatively updates can occur via book entry transfers (BETs). With an unallocated account, and assuming a credit balance in the account, the account holder has a general entitlement to a balance of gold but is an unsecured creditor of the account provider, who in turn has a liability to the account holder. This is analogous to a regular bank account. Therefore credit risk arises for the account holder while holding a gold balance within an unallocated account. Unallocated account balances are updated by book entry transfers (BETs). BET’s is a term used by the Bank of England for its gold bar accounting system. A similar concept is employed by the bullion banks. Unallocated account balances can also be transformed into allocated balances via the allocation of specific bars, and vice-versa. There is no central clearing counterparty in the London Gold Market. All gold traded loco London is cleared through an electronic clearing platform run by London Precious Metals Clearing Limited (LPMCL). LPMCL has 5 members, namely, HSBC, JP Morgan, Barclays, ScotiaMocatta, and UBS. LPMCL is a private company that was founded in 2001. All 5 members of LPMCL are founding members except Barclays, who joined in 2005. NM Rothschild left LPMCL in 2004. Credit Suisse was also a founding member but it departed in 2001, soon after it joined. Deutsche Bank departed from LPMCL in August 2015. The LPMCL clearing platform, named AURUM, clears trades via book entry netting and clearing using unallocated accounts. The majority of LPMCL clearing trades are processed by HSBC and JP Morgan. The clearers also ‘settle’ their own positions with each other between 4pm and 4:30pm each day via broker transfers involving 3 brokers. This is done to prevent excessive overnight credit exposure between the clearers. The clearers then end up with net gold positions. Following this, book entry transfers are then actioned between the clearing members’ accounts at the Bank of England, what the LBMA calls “transfers over clearing members’ accounts at the Bank of England“. The Bank of England provides gold accounts to it’s customers on an allocated basis, and customers hold title to specific gold bars held in the Bank’s vaults. A physical delivery of a customer’s bars in or out of the vault will credit/debit the customer’s account. The Bank also uses a system of book entry transfers where a customer can transfer bars between gold accounts held at the bank, without the need to move the bars. The bars remain in the storage positions where they already were positioned in the vault, and the Bank records the transfer of title from one customer to another in the Bank’s inventory management system. The Bank of England maintains that it does not provide unallocated gold accounts to its LBMA and central bank gold account customers. The LBMA’s gold clearing statistics, published each month, are for average daily clearing volumes of loco London gold transfers between the five LPMCL members during that month. The clearing figures include transfers of unallocated gold between parties within a member’s book, transfers between parties over the books of the five LPMCL members, transfers over the five members allocated gold accounts at the Bank of England, and also physical shipments of gold from LPMCL members accounts. For example, in August 2015, average daily clearing figures for gold between the five London gold clearers was 17.7 million ounces per day. This equates to 550 tonnes of gold loco London transfers cleared per day, in other words 137,500 tonnes of gold cleared per year in London. Using a 10:1 clearing to trading multiple, this would imply 5,500 tonnes of gold is traded each day, and 1,375,000 tonnes of gold traded each year in London. The clearing figures used in the 2011 trading survey only included the debit side of each transaction and so do not have to be divided by two. Likewise, the LBMA’s monthly clearing figures also only include the debit side of each transaction. Given that total world gold production throughout history is approximately 180,000 tonnes and that gold mining production is approximately 3,000 tonnes per year, then the volume of gold traded per day and per year in London is hard to understand, since the amount of gold being traded every day, just in the London gold market, is approximately 183% of the total amount of gold produced each year in the entire world. 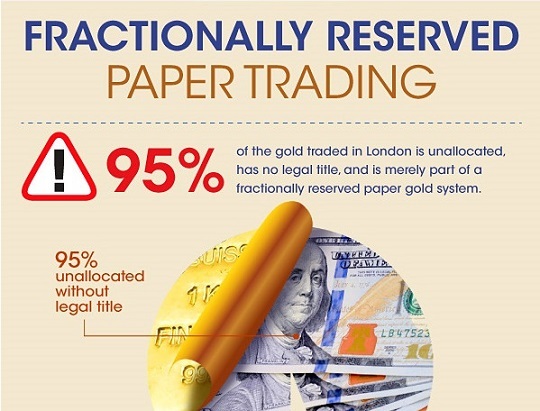 However nearly all of the gold traded in the London gold market represents paper transactions for unallocated metal and this metal may not exist. In April 2013, HM Revenue and Customs in conjunction with the LBMA and the London Platinum and Palladium Market (LPPM) produced a memorandum on metal transactions and VAT, in which it stated that “95% of transactions are in unallocated metal: therefore, because they are treated as services, the location of the underlying metal is not relevant.” Interpreting this 95% of transactions in unallocated gold, the London gold market is primarily a fractional reserve gold banking system, with a limited underpinning of physical gold underneath it. Not only does the LBMA not publish gold trading statistics, it also does not provide a breakdown of the transaction types to which the clearing statistics refer, for example, there is no information provided as to what percentage represents unallocated gold over the clearers’ trade books, what percentage refers to allocated transfers within the Bank of England gold bar transfer system, or what percentage refers to physical shipments. There is also no information provided as to transaction types such as whether the transactions are trades connected to spot purchases and sales, or trades connected to gold deposits and loans etc. Nor is there any information provided showing a breakdown by client type between the percentage of trades attributable to mining companies, gold refiners, trading houses or central banks. The Bank of International Settlements (BIS) publishes bi-annual OTC gold derivatives statistics in the form of the gross outstanding notional amounts of gold swaps, forwards and options. As of 31 December 2014, the BIS calculated that gross outstanding notional on gold swaps, forwards and options totalled $300 billion, of which $169 billion was for forwards and swaps, and $139 billion was for options. Since the LBMA 2011 trading survey found that 90% of trading represented spot, this means that the OTC London gold spot market is multiple times larger than the products captured by the BIS gold derivatives statistics. CPM Group claims that $18 trillion world of gold circulated in 2013, which, at an average price of $1530 in 2013, would be equal to 365,000 tonnes, about twice the entire known gold production, and more than 100 times annual mine production. Until the LBMA or the UK regulators publish gold trading details for the London gold market that explain what the huge daily gold clearing figures consist of, it is difficult to gauge what the rolled-up clearing figures refer to other than to assume (using the above evidence) that they represent a large series of predominantly paper gold transactions. The LPMCL clearing system uses a network of precious metal vaults located in London, and operated by 8 custodians. Three of these custodians, HSBC, JP Morgan, and Barclays, are LPMCL members. The Barclays vault is operated by Brinks. Another 4 custodians are the security companies Malca Amit, Brinks, Loomis (formerly Via Mat) and G4S. The final ‘vault’ is the combined gold vaults of the Bank of England. LPMCL members Scotia and UBS don’t have their own London vaults, and use storage facilities of the other vaulting custodians. In 2011-2012, Deutsche Bank had contracted G4S to build and operate a precious metal vault. This vault was built by G4S but soon after completion Deutsche Bank scaled back its precious metals operations in London, and resigned from the LPMCL company, and the vault lease was taken over by ICBC Standard Bank. See BullionStar blog “G4S London Gold Vault 2.0 – ICBC Standard Bank in, Deutsche Bank out“, for details. Malca Amit’s vault is located near Heathrow Airport. See BullionStar blog “The Gold Vaults of London: Malca-Amit” for details. In early 2015, the LBMA stated that there were approximately 7,500 tonnes of gold in the London vaults, three quarters of which were in the Bank of England. In early 2014, the same source reported 9,000 tonnes of gold bars in the London vaults with two thirds of this total at the Bank of England. For details see BullionStar blog “How many Good Delivery gold bars are in all the London Vaults?….including the Bank of England vaults“. According to the Bank of England, the Bank maintains gold accounts on behalf of 72 customers comprising central banks, international institutions, and LBMA member bullion banks. The international institutions in question include the International Monetary Fund, for which the Bank of England acts as a gold depository, the Bank for International Settlements and the European Central Bank. Some of these gold accounts may be historical or static, meaning that they may not hold any gold, Some 300 tonnes of the gold stored at the Bank of England is stored on behalf of the HM Treasury (HMT), and is classified under HMT’s Exchange Equalisation Account (EEA). See BullionStar blog “Central bank gold at the Bank of England“. According to the Bank of England Museum, the Bank of England stores gold in 8-10 vaults on 2 levels in the sub-basements of its headquarters on Threadneedle Street in the City of London. The entrance to the bullion vaults is through the Bank’s bullion yard which is accessible via Lothbury (a street) at the rear of the Bank. The exact number of vaults used to stored gold varies since the Bank uses vaults to store gold or cash depending on storage requirements. Although it does not report exact number of bars stored at any given time, the Bank has claimed that it was storing over 400,000 Good Delivery Bars as of 2015. The 7 LBMA forward market makers in the London Gold Market are HSBC, JP Morgan Chase, Scotia Mocatta, BNP Paribas SA, Goldman Sachs, UBS and Toronto Dominion. Both Deutsche Bank and Societe Generale ceased to be LBMA forward market makers in 2014, and Toronto Dominion became a forward market maker. BNP Paribas SA became a forward market maker in October 2015. Barclays ceased being a forward market maker in early 2016. Forward gold trades involve one of the two participants to a transaction buying or selling gold for US Dollars now, with an agreement to sell/buy the same quantity of gold back at a future date. From 2009, the forward market makers had supplied end-of-day gold forward curve data and gold interest rate swap (IRS) data to the London Metal Exchange (LME) for publication. This data was used by the London Gold Market to value end-of-day forward positions and consisted of pricing data out to 10 years for gold forwards and gold IRS. The data provision was discontinued by the forward market makers in September 2014 resulting in a setback for the transparency of the gold forwards market. London gold forwards were cleared by LCH.Clearnet until August 2014, with little volume. The London Metal Exchange (LME) intended to take over this gold forwards clearing service from LCH.Clearnet in September 2014 using its LMEClear service, but was unable to do so because the forward market makers ceased to provide forward pricing data with which to mark-to-market cleared forward trades. The CME Group continues to offer a clearing service for gold forwards using its own daily settlement price calculations based on an opaque collection process from London OTC brokers and other OTC market participants. In January 2015, in a further erosion of transparency for the gold forwards and gold lending market, the LBMA forward market makers also ceased contributing to the Gold Forward Offered Rate (GOFO) benchmark calculation, and so the LBMA ceased publishing GOFO data at that time. Deutsche Bank had ceased contributing to GOFO calculations in early 2014, and Societe Generale stopped contributing in October 2014. Some of the remaining contributors (Bank of Nova Scotia-ScotiaMocatta, HSBC, JP Morgan Chase, Barclay, Goldman Sachs, and UBS) then became unwilling to contribute to GOFO, and the calculation was discontinued due to lack of contributor input. GOFO was an interest rate quotation (for 1, 2, 3, 6 and 12 months) at which the market makers would lend gold against US dollars (on a swap basis), and was used in the valuation of gold swaps, gold forwards and gold lending/leasing transactions. Since GOFO was used to price and reset gold interest rate swap trades, the major participants in this market (mostly the market makers) wound down and compressed their gold IRS trades in late January 2015 in conjunction with TriOptima and the LBMA, just prior to the discontinuation of GOFO. London is the centre of the world’s gold lending market which operates through the Bank of England gold vaults. Both central banks and LBMA bullion banks maintain gold accounts at the Bank of England. Central bank gold held at the Bank of England can be lent to bullion banks using a transaction known as a ‘gold deposit’ under which the bullion bank borrows the gold and pays interest to the central bank. Accurate data on the amount of central bank on loan to bullion banks at any one time is not published, hence the amount of central bank gold that’s ‘in use’ by LBMA bullion banks at any given time is another unknown in the London market. This also adds to the market’s opacity. The LBMA Gold Price refers to a twice daily auction and to a benchmark reference price. The LBMA Gold Price auction was launched in March 2015 and is the electronic equivalent of the former London Gold Fixing auction process which began in 1919. The LBMA owns the intellectual property of the ‘LBMA Gold Price’ and registered ‘LBMA Gold Price’ as a trademark in August 2014. Each auction round lasts 30 seconds. The round duration had been 45 seconds per round when the LBMA Gold Price auction was launched, however ICE Benchmark Administration amended round duration to 30 seconds based on participant feedback. The chairperson chooses a starting price from relevant market data based on prevailing market conditions. Participants indicate their interest by entering buy or sell orders for gold into the ICE system. The auction’s goal is to achieve a balance between buy and sell orders within a tolerance of 10,000 ozs (about 25 good delivery bars). The opening price is chosen at the start of each round. Rounds continue until tolerance is within 10,000 ozs. The price from the final round of auction is published as the LBMA Gold Price. The resulting imbalance between buy and sell orders in the final round (<=10,000 ozs) is shared out between the direct participants. The tolerance had been 20,000 ozs when the LBMA Gold Price auction was launched, however, ICE Benchmark Administration subsequently lowered this tolerance to 10,000 ozs based on auction participant feedback. There are 12 direct participants authorised to participate in the gold auction – HSBC, JP Morgan Chase, ScotiaMocatta, UBS, Societe Generale, Barclays, Goldman Sachs, Bank of China, Morgan Stanley, Standard Chartered, Toronto Dominion Bank and China Construction Bank. Direct participants are accredited by the LBMA and have to be at least Ordinary members of the LBMA and have sufficient credit lines, as well as adequate clearing and settlement arranges with existing direct participants. Although the LBMA Gold Price when launched in 2015 was trumpeted as a far more robust and transparent alternative to the previous opaque and manipulated London Gold Fixing auction procedure, it is still not transparent and ICE Benchmark Administration will not reveal some details of the auctions such as who the auction chairpersons are or how the starting price and intra-round prices are determined. See BullionStar blog article “Six months on ICE, The LBMA Gold Price” for details. The list of direct participants in the auction is also still very limited and consists entirely of LBMA bullion banks, the vast majority of which are LBMA market makers. The expectation that a number of the large Chinese banks would join the auction as direct participants has only partially been realised, and ICBC is not yet a participant. See “Chinese Banks as direct participants in the new LBMA Gold and Silver Price auctions? Not so fast!” for a background on the London based Chinese banks and auction. A number of the large well-known physical gold ETFs store some or all of their gold in commercial gold vaults in London. As of September 2015, this London stored ETF gold totalled more than 1,100 tonnes. The largest physical gold ETF, the SPDR Gold Trust (GLD), employs HSBC as its custodian, and all the GLD gold is stored in HSBC’s vault in London. In December 2012, GLD held more than 1,350 tonnes of gold with HSBC in London, but by 2016, the figure was only 700 tonnes following sustained redemptions of gold from GLD, particularly during 2013. ETF Securities operates a number of gold backed ETFs which also store their gold at HSBC’s main London vault. The iShares Gold Trust (IAU) uses JP Morgan as custodian, and stores its gold across three vaults, namely JP Morgan London, JP Morgan New York and Scotia Mocatta Toronto. Other ETFs using JP Morgan London for gold storage include Deutsche Bank and Source. South African bank ABSA has a gold ETF which uses Brinks London vault as a storage location. For details of the ETF gold stored in London, see BullionStar blog “Central bank gold at the Bank of England“. ETF trading structures utilise ‘Authorized Participants (APs)’, which are appointed by the Trusts as the sole entities authorised to create and redeem baskets of ETF shares. In the case of gold ETFs like GLD and IAU, these authorised participants are the only agents allowed to directly swap ETF shares and take delivery of gold, or swap gold for ETF shares. APs are market makers, but only some of the ETF market makers are APs. In the London market, most of the APs for GLD and IAU are LBMA market makers such as JP Morgan, Goldman Sachs, Merrill Lynch, and Credit Suisse. So these entities, as well as providing liquidity for the gold ETF market, can also access the underlying gold of the ETFs by collecting and redeeming ETF baskets. In addition to being the largest gold market in the world, London used to be one of the largest physical gold refining centres, with Johnson Matthey, the Royal Mint Refinery (owned by Rothschilds) and Engelhard being the main refiners. However, various competitive developments in the global gold market gradually eroded the English gold refining sector beginning in the 1960s. The Royal Mint Refinery (RMR), run by Rothschilds since 1829, and based near Tower Hill in London, was wound down in 1966 when one of its large gold supply sources from Ashanti Gold Corporation in Ghana began using a new Ghana state gold refinery. Rothschild sold the RMR business to Engelhard, and the Royal Mint Refinery premises closed in 1968. Engelhard first refined gold in Sheffield from 1934 and then opened a refinery in Chessington, Surrey (near London) in 1968. Following the collapse of the London Gold Pool in 1968, the three large Swiss Banks, UBS, SBC and Credit Suisse formed the Zurich Gold Pool and took most of the South African gold sales business from London by the early 1970s. Since each of these Swiss banks owned a gold refinery during this time (UBS – Argor, SBC – Metalor, and Credit Suisse – Valcambi), this refining business went to the Swiss gold refineries. In 1998, Engelhard, at that time named Engelhard CLAC, closed the Chessington refinery. Engelhard was acquired by BASF in 2006. Johnson Matthey first refined gold in London, at Hatton Garden in 1837, and opened a gold and silver refinery in Royston, north of London, in 1955. In 2005, due to what it described as over-capacity in the global gold refining industry at that time, Johnson Matthey closed its Royston gold and silver refinery. This refinery was thought to have an annual gold refining capacity of 200-250 tonnes. The Royal Mint is another integral part of the UK gold market in terms of gold bullion coin production. Although the Royal Mint was located on Tower Hill in London from 1810, it moved to Wales in the 1970s. The Mint’s facility in Llantrisant, South Wales, manufactures the well-known Sovereign and Britannia gold coins which are key coins in the global gold bullion coin market, and which are actively traded in the secondary market by UK gold wholesalers and dealers, and some bullion banks. Under HM Revenue and Customs (HMRC) rules, the gold Britannia and gold Sovereign are Capital Gains Tax exempt in the UK due to being classified as sterling legal tender under the Coinage Act. The Royal Mint’s Welsh facility also includes a secure precious metals vault built to Bank of England specifications, so it could theoretically hold some of HM Treasury’s gold reserves. London is also headquarters to a number of leading gold and precious metals consultancies, such as Thomson Reuters GFMS and Metals Focus, as well as global headquarters to the gold mining industry’s World Gold Council. The London gold market is one of the two main contributors to gold price discovery globally. The market is the world’s centre for wholesale OTC gold trading, with every major bullion bank represented. London has the world’s highest gold trading volumes, and gold market participants around the world settle trades through London using the loco London gold trade settlement concept. London is also unique in hosting the twice daily LBMA Gold Price auction which is used as the de-facto global gold price benchmark for pricing transactions in gold markets and gold products around the world. The LBMA plays a key role in the market by representing the interests of banks and global gold refiners. 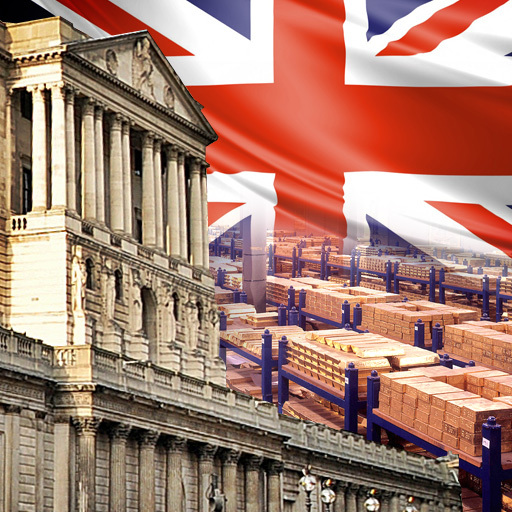 The Bank of England is also a major component of the market through its provision of gold custody storage vaults to central banks and LBMA members. These vaults also play a role in facilitating the London gold lending market between the central banks and LBMA member bullion banks. Price manipulation scandals in LIBOR, foreign exchange, and precious metals have led UK financial market regulators to call for increased transparency in trade reporting. This applies particularly to the OTC London precious metals markets because of the opacity of the market and because there is no on-exchange central clearing system and no trade volume reporting. However, the large bullion banks which run the LBMA and the London gold market have continued to resist change and transparency. In fact, transparency in the London gold market deteriorated in 2015 even compared to 2014. The calculation and publication of GOFO rates has been discontinued. The use of exchanges for gold forwards clearing has been discontinued. The LPMCL member banks are not interested in moving trading and clearing of gold transactions from an over-the-counter to an exchange based model. Recent moves by the World Gold Council to convince London bullion banks to move to a central clearing system for gold trades only managed to bring five banks on board with the plan (Morgan Stanley, Goldman Sachs, Citigroup, Societe Generale, and ICBC Standard Bank), but none of the incumbent LPMCL members were interested. The structure and management of the new LBMA Gold Price is still controlled by the same banks that controlled the old gold fixing process and ICE Benchmark Administration has cooperated in stifling market transparency. There is no transparency from the Bank of England as to which central banks and bullion banks are engaged in gold lending, and there is little if anything published about the London gold lending market, full stop. The entire London gold market is still opaque. Since the London gold market is the world’s largest gold market, this opacity is not healthy for efficient markets or price discovery. Behind the scenes, the Bank of England takes a keen interest in the London gold market, and has a very close relationship with the bullion banks through the LPMCL clearing system and through the gold lending market. In fact, the Bank of England, along with the Financial Conduct Authority even sits on the LBMA Management Committee. With the Bank of England and the LBMA bullion banks in such powerful positions within the London gold market, nearly everything that happens in the London market is an outcome that has been orchestrated and planned by these entities, and needs to be seen as such.